A book club, which is also known as a reading group, is a gathering of people who meet regularly, either in person or online, to read and talk about books. Within a discussion group, readers can focus their opinions, enhance their understanding and gather new perspectives. Book Club Sets are offered as a service to book club groups. Vancouver Public Library has selected titles in sets of 10 copies for an extended loan period of six weeks. A folder of reviews and a short author biography accompany each set. The books and folder are packaged in a canvas carrying bag. Book Club Sets will be signed out to one VPL library card holder who will assume responsibility for returning the books to the library. 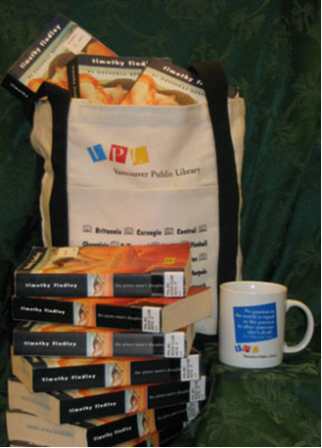 The sets may be reserved through your local VPL branch and picked up there and can be returned to any VPL location. Renewals are not permitted. You may have two sets on your card at one time. A printer-friendly list of all Book Club sets is also available. All book clubs at Vancouver Public Library are free but most require registration through the locations the book clubs are being offered. For details and a full list see VPL's online event calendar. Members read and discuss two books a month. A list of book clubs in British Columbia, those with contact information are accepting members. A good place to look for clubs as well as advertise your own. A list of book clubs in or near Vancouver. Mystery fans discuss everything related to mystery, crime and suspense. You must register to post comments, but lurking is free! An online community for book lovers who want to read classics and new releases. Monday through Friday, you will receive an email with a five-minute selection from a chapter of a book if you like it get the complete book from your local library. An online club where you discuss books using your email.